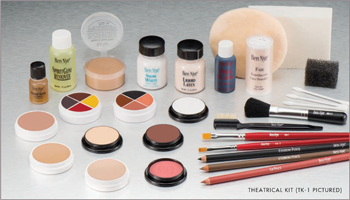 Theatrical Makeup Kits contain expert components that produce professional results on stage or in the classroom. Ben Nye’s formulas apply velvety smooth, feel light, and remain steadfast through the final curtain. They are gentle to sensitive skin and clean up easily with soap and water. This kit provides enough makeup for your entire cast. Read more...Purchased separately, these items would cost over $100! In each kit you’ll get: 3 blendable crème base foundations, contour palette (crème rouge, 2 crème shadows, and crème lip color), bruise and abrasions wheel, translucent face powder, velour powder puff, crème highlight, crème shadow, white crème makeup, black pencil, eyebrow pencil, dry rouge, dry rouge brush, nose and scar wax, lip pencil, flat brush #3 and #7, sponge applicators, stipple sponge, liquid latex, spirit gum, spirit gum remover, silver hair color, eyebrow/lash combo brush, and stage blood.